Whether it’s a new build or a complete remodel, many baby boomers are in the market for a refreshed space. Dan Vanderheyden knows that downsizing doesn’t have to be a dirty word. After raising three children in Plymouth, he and his wife Julie decided to start fresh. Their goal was to create a beautiful, smaller space that fit their needs. “The idea behind this home is that living small can be everything we hope for,” Dan Vanderheyden says. As the owner of Black Dog Homes, Vanderheyden has worked in the construction business for 10 years. When it came time for the baby boomer to build his own home, he and his wife purchased a 750-square-foot rambler. With a complete remodel, the home is now about 1,600 square feet, a far cry from the approximately 3,600 feet in the home where they raised their children. The motif of the new space is all about efficiency and making the most out of less. 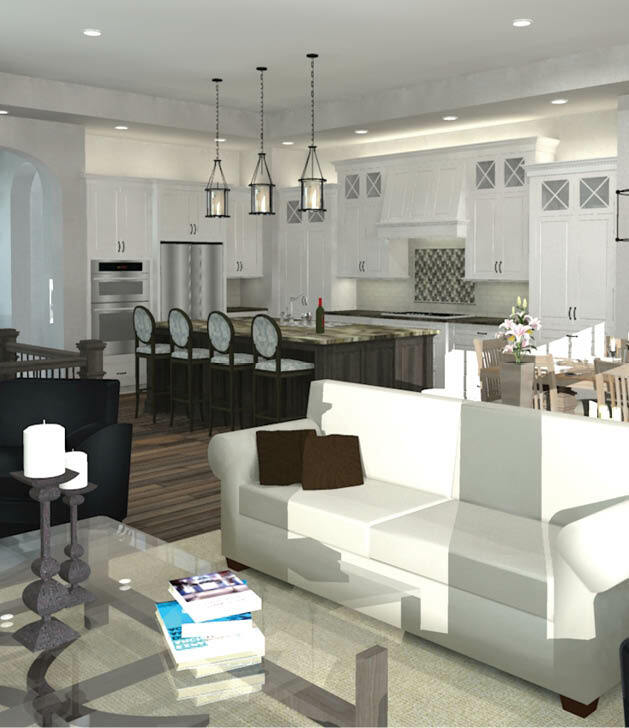 The main level features the living area, with kitchen, dining room, office, mudroom, half-bath and living room. Upstairs features a master bedroom/bath, with one guest room. “This type of space might intrigue people in the baby boomer stage,” Vanderheyden says. “The kids have been raised, and you may not be ready for townhome or condo living, because you still want your own property.” The lot is about 60 feet wide and 125 feet deep, he says; the front yard is smaller, and a detached garage creates a courtyard behind the house. Vanderheyden’s new home is only 24 feet wide, making efficiency all the more important. When designing the space, the theory was to create two-thirds living space and one-third utility space. “It’s trying to make something small feel much larger,” Vanderheyden says. Michelle Olson of Mingle worked as an interior designer on the Vanderheyden home. She specializes in kitchens and baths, and says her goal was to maximize storage while maintaining an open concept. In the kitchen, she focused on putting in drawers and getting creative with built-ins to use space efficiently. While downsizing is a great option for some, renovating an existing home can be just as beneficial for boomers. Many people love the neighborhood they are in or can’t imagine moving out of the home where they raised their kids. At the same time, they might be in a home that needs repair—or perhaps they have an elderly parent or adult child moving in with them. Rick Denman of Charles Cudd De Novo, an architecture, design and construction firm, works on these types of home renovation projects. Often he’ll come across houses that were built 20 or 30 years ago that are still great homes, but could use some cosmetic updates. 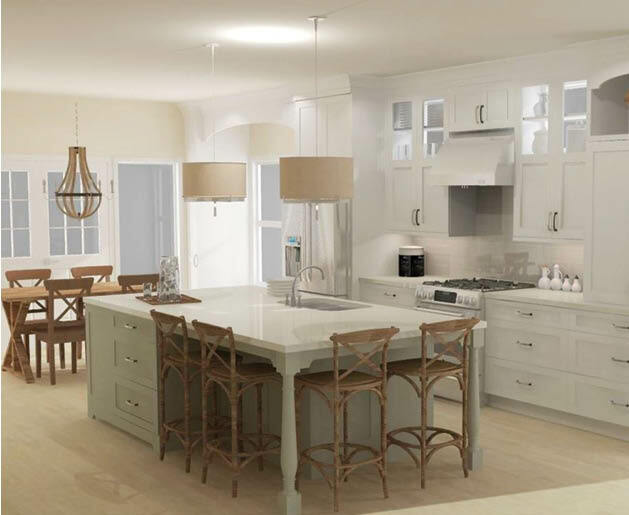 “The biggest thing people are looking for is to redo their kitchen,” Denman says. People want the upgrades of new construction while remaining in their current home. This often means creating a space where they can entertain family and friends, and have more space when grandkids come to visit. 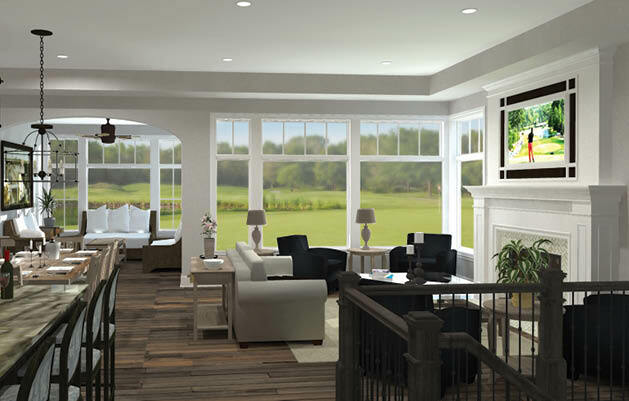 Many older homes have layouts that are more closed off than those in modern homes; because of this, one of Denman’s common requests is creating an open concept. “It’s a way to make the main level more luxurious,” he says. Charles Cudd De Novo specializes in “architecturally designed homes and villas.” These homes are similar to townhomes in that an association runs them, but they have the benefit of their own yard. The homes are small and efficient, making them less expensive to maintain, and combine the convenience of a townhome with the privacy and feel of a single-family home. Whether you’re looking to remodel or build a brand-new home, the most important thing is to know your options. “Mull everything over, and don’t set your mind on one option until you’ve explored everything,” Denman says. He cautions not to overdo it if you do choose to remodel and plan on selling later. Kitchens and master bathrooms tend to be the best value for resale when it comes to remodeling, and are wise places to invest if you plan to sell. At the same time, sentimentality can trump all, and if you aren’t worried about reselling and have the economic resources, you can re-craft your current home into your new dream space. No matter what project you settle on, the best advice is to consult with professionals, Denman, Vanderheyden and Olson agree. Make sure to work with people who know the city codes; especially when it comes to remodeling, there are often strict rules to follow for things like expanding above the garage or building a new in-law suite. When creating a smaller space, as the Vanderheydens did, professionals can help make the most of the room you have. Most of all, if you follow a plan that is best for your own needs, you’ll end up with your own dream home. Architectural design consultations: The city of Plymouth pays a $25 consultation fee with an architect to update homes that are at least 30 years old. Home repair grants: Plymouth residents 55 years and older can get a $5,000 grant for emergency repairs on their home. Income limits apply. Home repair loans: Zero-interest loans of up to $30,000 to repair and improve homes. Income limits apply. For more information on these programs, visit the City of Plymouth website.